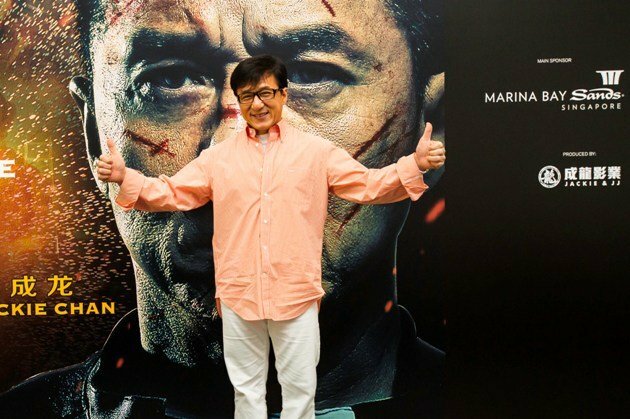 Hong Kong actor-martial artist Jackie Chan has revealed that he has obsessive-compulsive disorder (OCD) and attention deficit disorder (ADD), confirming what his son, Jaycee Chan, said in a Chinese show back in October. During a Tuesday press conference ahead of the premiere of “Police Story 2013” in Singapore, Chan told reporters he has a lot of “problems”. Chan said he’s always cleaning the table, and that things always have to be in place, neat and tidy for him. The "CZ12" actor also said that his condition led to him putting a lot of pressure on his son. For example, Chan said he is always arranging the shoes for Jaycee and picking on his son's bad habit of running around in white socks, which causes them to be dirty. The superstar also revealed that over the years, he’s been struggling to relax. “If I don’t film movies, I don’t know what to do. I live for movies, every day I think about different movies, stories and ideas,” said Chan. He revealed plans to film several movies after the promotions for "Police Story 2013". Chan said he could be filming "Karate Kid 2" and if he could come up with good ideas, a sequel for "CZ12". Aside from filming, he also has several businesses on his plate such as a red wine and a watch business. Chan also has plans to organise a peace-friendship concert in Beijing next year to celebrate his 60th birthday. There have been media reports that Chan, who is known in the entertainment industry for performing all his film stunts himself, was considering using stunt doubles. On that, the 59-year-old admitted to using stunt double for “Police Story 2013” – but they were for rather unexpected scenes, such as walking and driving scenes. The martial arts star said that for this film, he didn’t use any stunt performers for any of the fighting scenes. In fact, he said he’s been using stunt performers for a long time, but people don’t feel it as it’s for non-fighting scenes. However, the famed stunt performer revealed a more vulnerable side during the press conference. “I’m very scared that I’ll be wheelchair bound for the rest of my life," said Chan. Recalling an accident during the filming of his highly successful action film "CZ12", Chan said that he felt “numb”, “paralysed”, and as though his back broke when he fell. "I wonder, 'Am I so lucky every time?' I just have to be unlucky once, and that's it for me,” said Chan. Thus, Chan said he has to be more careful and responsible to his family, fans and himself. He added that nowadays, he'll ask someone else to try certain stunts before attempting them himself, so that he'll know what to look out for. Separately, Chan said he could really empathise with his role in “Police Story 2013” as his actual personality is very similar to the character he plays – one that doesn’t really care about his family and is always working. “It’s very difficult to have the best of both worlds,” said Chan, adding that he often tears up during filming. He also said that what’s special about this installment of “Police Story” is that it focuses on plot and social issues, and it’s not all about fighting. Chan said that he has matured and wants to let people know that he’s an actor, not just a martial arts actor. “Police Story 2013” is the latest installment under the successful "Police Story" action-drama franchise. The last installment was “New Police Story” in 2004. The action film features Chan alongside Chinese actor Liu Ye and Chinese actress Jing Tian, and is directed by Ding Sheng, who previously collaborated with Chan in “Little Big Soldier”. It opens in cinemas on 24 December.